If you need more cleaning power, moisten the CLOTH (not the guitar) with a little mild detergent in water. Use as little moisture as possible to avoid it getting into any tiny voids in the finish. Follow the damp wiping by buffing with a dry cloth to remove any streaks. Mineral spirits or naphtha (lighter fluid) won¡¯t injure the finish of the guitar when trying to rid the guitar of sticky residue (originating from stickers/tape, etc). Apply the solvent with a disposable cloth, and turn the cloth often to avoid smearing the adhesive around the finish. A light buffing with a damp cloth should take care of any solvent streaks left behind. 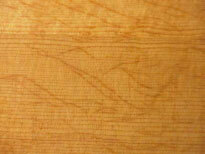 A light coating of oil gives the surface of the fingerboard a finished and clean look. 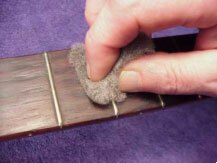 Use a tiny amount of lemon oil or mineral oil on a rag to wipe the fingerboard, and then wipe it all off. Don¡¯t saturate the fingerboard, and don¡¯t get oil in the cracks. If there are cracks in your fingerboard, consider having them filled professionally. Stay away from linseed and other natural vegetable oils, as these become sticky and gummy over time. This kind of fingerboard cleaning should be an annual event. Too much scrubbing and oiling can do more damage than good. A guitar with cracks or a bad finish should be approached with caution, as oily polishes will absorb the polish and stain the surface of the wood. This will become more ugly as the years go by. Creamy polishes have a tendency to build up on the surface, leaving a film behind. It is possible to build up a waxy finish. Clean this creamy polish off with a light detergent and water on a cloth, and try another brand of polish. Very light surface scratches may often be ¡®rubbed out¡¯ by hand, using a variety of automotive and plastic polishing compounds. For recommendations about this sort of polish, go to your local music store. The finish on the back of the neck gets the most handling of all. As it is handled, the lacquer may react to your skin chemistry and become soft; increasing the rate at which it wears, causing the finish to wear off. You can¡¯t clean the finish if it has already worn off. These are examples of long term wear, however the softening of the finish may be noticeable even when a lacquer finished guitar is quite young. If you notice a dull area where your arm crosses the face, don¡¯t polish it vigorously. It would be a better idea to take it to a professional luthier for some advice. 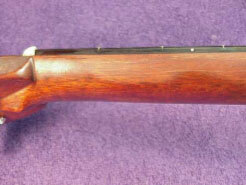 **Luthier: Literally, ¡®lute maker¡¯, it has become a general term for a maker of violins or other string instruments. Similarly, the derivative ¡®lutherie¡¯ (lute making) has acquired the meaning of instrument making in general.